Type: Transportation, For Sale - Private. Dedicated truck driving is all about stability. As a Dedicated driver, you'll haul freight each day for a single assigned company or business account from among some of the most recognizable brands in America today. You'll get to choose between Local and Regional positions. Moreover, you'll know the people you work with better. Last but not least, you will get to make it home more often. With our regular schedules and increased stability, our drivers are able to get more out of their daily lives, both professionally as well as personally. Why drive with our trucking company? Competitive Pay: We have more than 200 generous pay packages available. We use state-of-the art technology to ensure driver safety, and sustainability; including satellite communication to keep our drivers connected. Up to 80% of our drivers receive nightly/weekly hometime. Our unique pet policy allows drivers to bring their furry friends on the road. 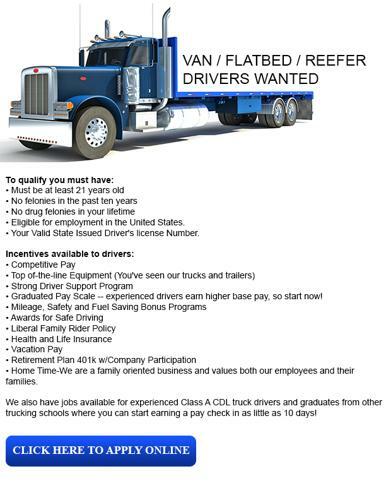 We have many opportunities for team drivers. We provide regional opportunities for students. We offer an extensive & on-going safety training program. You'll have the option to sign on with our lease purchase program to become an owner operator. Thanks to our various divisions & diverse operations, our drivers are allowed to live in any area of the country they'd like. Everything from A to Z is taken into consideration when matching a driver with a particular division, including the position's mileage requirements, home-time needs and the driver's route preferences. Proving that no matter where you live, you can take your career in any direction you want. Over 80 percent of our driving jobs are in more attractive, shorter-haul Regional and Dedicated fleet operations that enable us to return drivers home to their families more frequently.